We often encounter stories of heroes. Usually they are people who create brave deeds on a large scale, saving lives, serving in the military, giving selflessly to others. I originally heard this story on NPR, with both participants narrating their own pieces of the story. I wondered what was wrong with the man’s voice. I soon learned of his amazing sacrifice. Here is the story reprinted, with thanks to the Alzheimer’s Reading Room and National Public Radio. 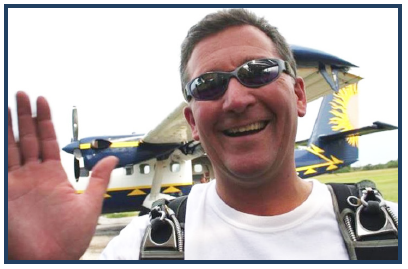 In 2009, veteran Texas skydiving instructor Dave Hartsock was in the middle of a 13,000-feet-high tandem jump with Shirley Dygert, a grandmother and first-time diver, when he discovered that neither of his two parachutes would open all the way to stop their free fall. Red alerts screamed through his brain as he struggled to untangle the parachute lines. They fell thousands of feet, then a few thousand more. With just seconds left to go before impact, Hartsock opted to use control toggles to rotate his body so that he’d cushion Dygert, absorbing the brunt of the force when the two of them hit the ground. Elizabeth Svoboda is the author of What Makes a Hero? : The Surprising Science of Selflessness.